The view from atop the Buda Castle Hill is superb! Having covered its history and role in the life of Buda last week, I wanted to show you more of the beautiful Castle District. 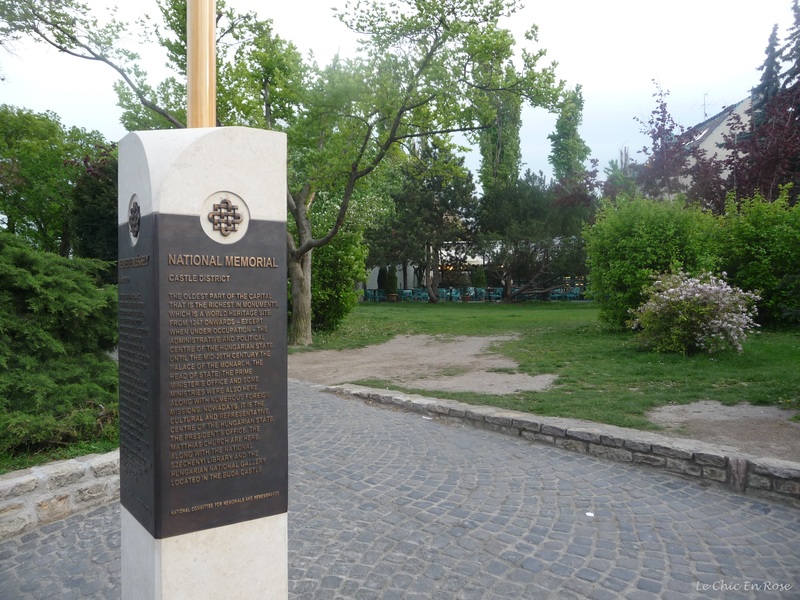 The area along the Danube, which contains the Buda Castle District and the Houses Of Parliament on the Pest side, is part of a UNESCO World Heritage Site. If you remember Monsieur Le Chic and I were initially confused when we got off the funicular, as to whether we were in fact at the Castle! Hence we wandered off along the pretty narrow streets of Buda, which led us to yet another lookout point – this time at Fisherman’s Bastion. Just as well that by this stage I’d purchased a local guide book! With it’s pretty pale grey turrets and towers it would have been quite easy to think that this was the real Buda Castle! Fortunately by reading the guidebook we had purchased from the tourist centre and also by taking a guided walking tour round the whole district, we were able to put everything into context! The Bastion in its current form is actually quite a modern construction, not the fairytale medieval castle that it first appears to be, but nevertheless enchanting! It was built between 1895 and 1902 from plans drawn up by Frigyes Schulek. Due to the terrible destruction wrought on the area during World War II it had to be comprehensively restored. This restoration was carried out under the direction of Frigyes’s son, János, in 1947-48. Its seven towers represent the Magyar (Hungarian) tribes that first settled in the Carpathian Basin in 896. According to local legend, there was a stronghold here, which was protected in medieval times by the guild of fishermen and that is how it came to be known as “Fisherman’s Bastion” (Halászbástya in Hungarian!). As the Bastion is situated a little further along the Danube from the site of the old Buda Castle and Royal Palace, you get even better panoramic views than from the Buda Castle Lookout (if that were possible)! Not only can you gaze across the Danube towards the Houses Of Parliament and over the roofs of Pest, you can also see far into the distance towards the vast flat plains stretching out beyond Pest and up the Danube river in the direction of Bratislava and Vienna. The only drawback is the popularity of the area with tourists, although as we were visiting on a particularly crisp and chilly spring day, it wasn’t especially crowded. I would imagine that it would be a very different story during the Christmas Market season and the summer months though. Nearby in Holy Trinity Square is the magnificently restored Matthias Church (officially the Church Of Our Lady in Buda Castle). It was originally founded in the 13th century and has had a colourful history over many centuries. The “Matthias” in question is in fact the Hungarian King, Matthias Corvinus (King Of Hungary and Croatia from 1458-1490), who held both his weddings here. In 1541 when the Turks occupied Buda it was turned into a mosque and later destroyed in the wars to liberate Buda. After the reconquest of Buda in 1686, it was rebuilt in a Baroque style. For six centuries it was used as the Coronation Church for Hungarian Kings, including in 1867 when Franz Joseph 1 was crowned King Of Hungary and his wife Elisabeth (Sisi), the Queen. It was remodelled in its present neo gothic style for the Millenium celebrations in Hungary in 1896. Reconstruction after World War II was partially carried out in the 1950s and 60s and then between 2006 and 2013 a major restoration project was undertaken with assistance from funds provided by the Hungarian Government. The church has a unique charm about it and there is still a feeling of oriental influences amidst the gothic towers. Ornate restoration work has been carried out on the church – the roof work in particular is exquisite! In addition to the funicular (or Shank’s pony route if you fancy the walk up the hill) you can can reach the Castle District by public transport. If you are going to start off your visit at the Matthias Church/Fisherman’s Bastion end of the Castle District, this might well be the best option. Now finding your way around by public transport might seem a little confusing at first but once you get the hang of it it is quite straightforward (although admittedly Monsieur Le Chic did work most of it out so I mustn’t take all the credit)! 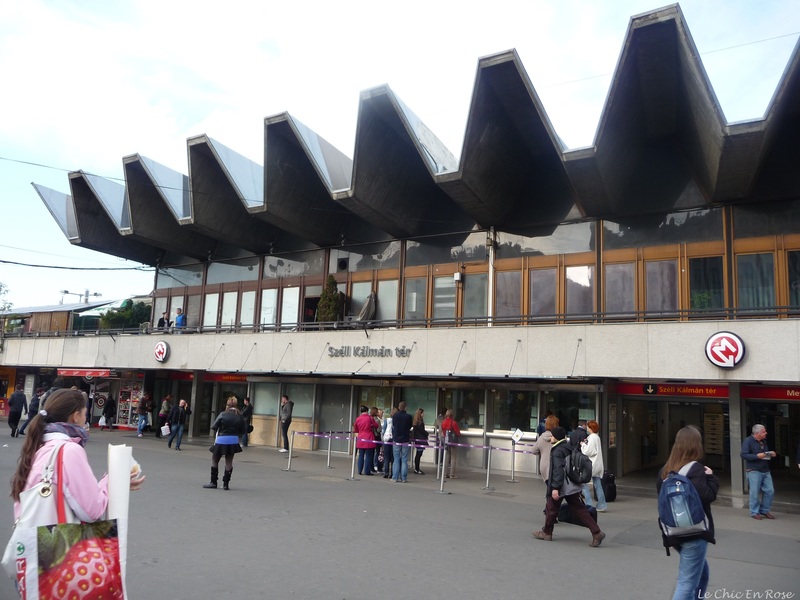 Metro Line 2 (the Red Line) will take you to Szell Kalman Ter (formerly known as Moszkva Ter) from central Pest. Metro Station for Buda Castle District Szell Kalman Ter. Exit here to catch buses 16, 16A or 116 to Buda Castle District. Once you exit the station, walk up the steps to the road above on the hill. You are looking for bus numbers 16, 16A or 116 – all of which take you up into Old Buda and the Castle District. It’s fairly straightforward and takes about 10 minutes from the metro station to Matthias Church. You should see the church appearing and then you know to get off the bus. If you do get off a stop or two too early or late, you are very close by and walking won’t be a problem! The streets are all so pretty too with cobblestones and old buildings so it’s pleasant to stroll round anywhere in this district. Just a further note on the Metro system. There are now 4 metro lines: Metro 1 (Yellow), Metro 2 (Red), Metro 3 (Blue) and Metro 4 (Green and only opened this year 2014). Metro lines 1 to 3 all intersect at Deak Ferenc Ter, which is the major transport hub in Central Pest. From here, you can catch the number 16 bus all the way to the Castle District too without having to get the metro at all if you prefer. Metro line 4 doesn’t meet the others at Deak Ferenc Ter. Its primary role is to link Keleti Railway Station in Pest with Kelenfold Railway Station in Buda (stopping along the way at Gellert Ter, the stop for the famous Gellert Baths). Now we have all the transport sorted, back to Fisherman’s Bastion. Since there was a bitter north wind blowing we needed some warming refreshments so although it’s not the cheapest place we popped into the cafe situated within the Bastion. With the wind whistling through the unglazed stone windows, it was freezing – though we did have a magnificent view! As we were leaving we realised that adjoining the cafe was another restaurant – part of the same complex we subsequently found out – which had fully glazed windows, was warm and afforded shelter from the wind. We went back there the next day to enjoy the view in the warmth! You don’t have to eat a large meal here either; it’s perfectly fine to order drinks or just a coffee! There are many cheaper eateries and cafes down the little side streets in the Castle District but they don’t have quite the same view, although the ones we went to were very pleasant! Fisherman’s Bastion Cafe/Restaurant the warm side sheltered from the north wind! Fisherman’s Bastion is open every day and night all year round. It’s free to walk around, apart from a fee to go up to the top turrets. We didn’t pay the fee and were quite happy wandering around and taking photos without going right up to the top! If you want to know more about the history of the Castle District there is an obelisk near Fisherman’s Bastion, which explains a bit about the area. It’s helpfully written in English too! Beautiful photos! Thank you for the tour! Thanks Amy it is truly a beautiful place! I loved Budapest it had a great vibe and I’d love to go back there for another visit! Beautiful photos! I was just in Budapest last month. I started at the top by Matthias Church and worked my way downhill. I have to say I had the same confusion – I thought the Fisherman’s Bastion was so pretty but I had no idea what it was exactly in the moment. Loved learning a bit more about it in your post! 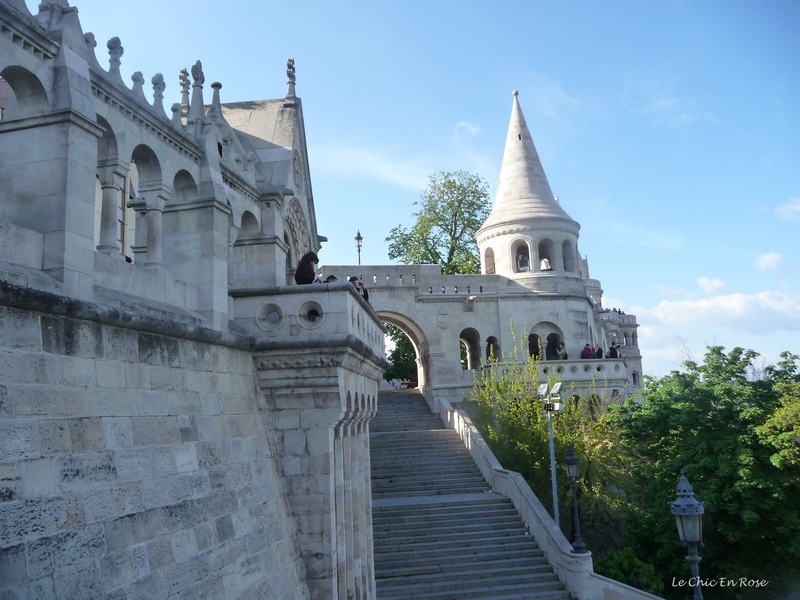 The architecture and views are beautiful Rosemary – I would have mistaken the Fisherman’s Bastion for the castle!! Looks like they did a superb restoration job too. It seems like this was a great time to visit – nice blue skies but not too many people, worth knowing for future reference! I’ve never been to this part of the world but your photos and descriptions make me think it’s well worth a visit! I was there myself just last week – wonderful city – I like your pictures! Great views! I’ve always wanted to visit Budapest, heard so much about it! Thanks for the useful information on public transport 🙂 From the pictures we can see it was really cold! I can’t wait to go to Budapest – it’s been on my bucket list for so long! Your photos are so beautiful!